Deputy Director General Dental Services (DDG/DS) division of the Ministry of Health with the assistance from the Director Oral Health is responsible for the coordination of the Dental Services island-wide. As an island-wide service appointments, transfers and any other human resources management decisions with regard to the Dental Surgeon are handled by the DDG/DS division and the Director Oral Health. 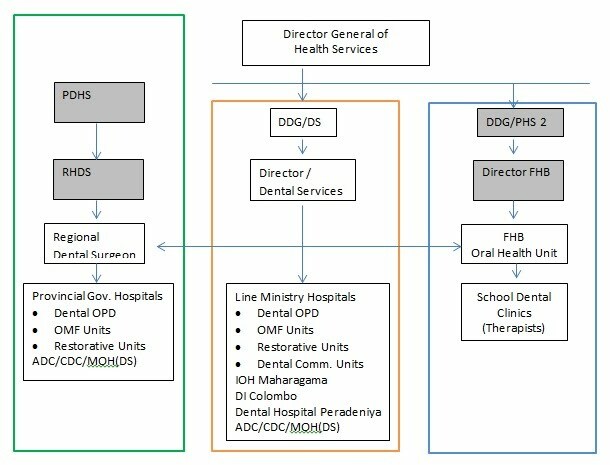 While all the Dental Services related to the line ministry institutions are handled directly via the Ministry of Health for Institutions that are under the Provincial Health Departments, the Regional Dental Surgeons that are attached to the Offices of Regional Directors of Health Services act as an intermediary. School Dental services are handled by the Oral Health Unit of the Family Health Bureau. The DDG/DS division coordinates with this unit to uplift the dental services delivered to the school children through the school dental clinics manned by school dental therapists.